the church I grew up in as a child. It is a very small church in a small village in the north-west part of Romania. (I think it would be good to be able to post some stuff about this village). The church now is very different, as one would expect, from the church that I grew up in.For a start there is a new building, which was inaugurated two years ago. The old church building was built somewhere in the 1930s and it was beginning to fall apart. The location has changed also: the church now is nearer my parents house (which is good as they are getting older) and in the middle of the village (closer to the local Orthodox Church). 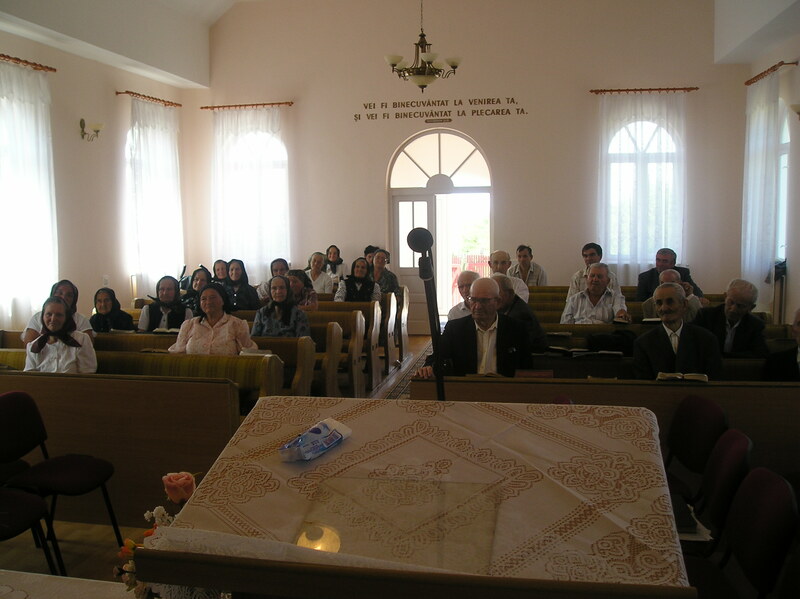 People worshipping in Miheleu Baptist Church in August 2007. The new building is very nice but with inadequate access for older people. It has lots of steps, and no disable access. This is relevant as the age profile of the congregation has dramatically changed since my early days in this church. 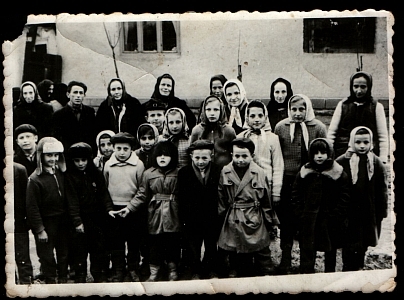 I remember that when I was a child the church would be full every Sunday, with at least 80 people attending each service, plus about 10 to 15 children. Now though there were about 25 people each Sunday. Most of the members are over 60 years old and frail. However I have to say that it is not only the church that feels the absence of younger generations, but the village itself is lacking the ‘young blood’. This is a common phenomenon in many villages in Romania, in particular in those villages that are some distance from a city and with bad roads (another story to tell – roads in Romania are dreadful). I tried to keep in touch with the church even when I was away through my parents and when I visited them I made sure I spent at least a Sunday in the church in Miheleu. And I tell you, every time I go I am expected to preach. This year, as every year, I gave them a report: what I was up to. The second Sunday they had two guest preachers from Emanuel Baptist Church in Oradea (the city), but I still had to preach. In the afternoon a friend of mine who is a pastor visited, and he also preached. 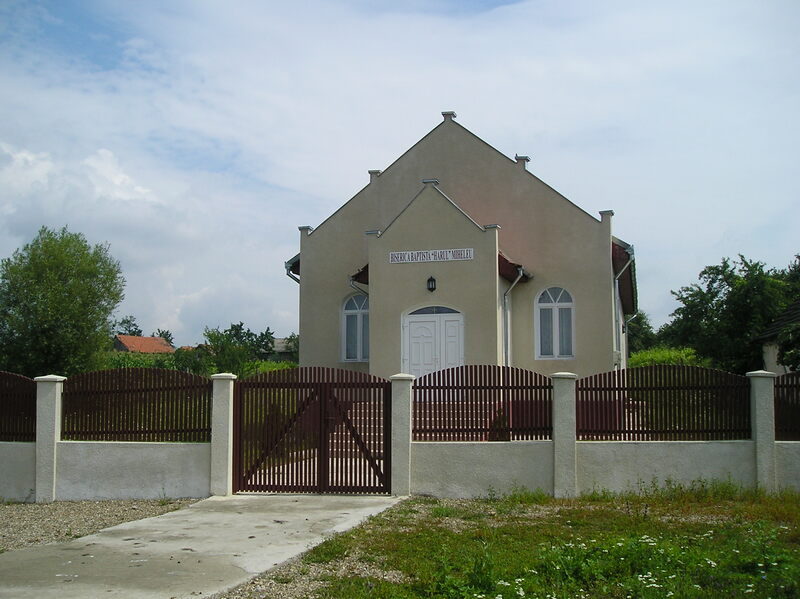 The church service in a Romanian (Baptist) Church is normally much longer than in Britain. On Sunday morning the service starts at 9 am and finishes any time after 12 am. In the afternoon it lasts anything between an hour and a half to two and a half hours. The last Sunday the pastor come with another pastor who is now based in the United States (an old friend of mine – we used to go visiting churches together in the 1980s). The pastor comes visit them once a month, as he has three other churches, one of them is in the city. Note: Don’t look for me in the old photo. I was too young when it was taken, but my sister is there. The girl bottom right hand side.